Written by screenwriters Matt Leslie and Stephen J. Smith, the story concerns four teenage boys in a small town. Suburban life is examined under a keen microscope and twisted to create a compelling, while not entirely original, narrative. Considering the movie isn’t anywhere near the budgets of the Netflix series or the re-telling of a Stephen King classic, the film does a wonderful job in quickly establishing the timeline through model households, casual clothing, and average family vehicles. Le Matos provides the music that meets the eardrums with the expected notes that evoke 80s charm – it might be a horror film but you can’t help but jive a bit in the process. Listen closely, and there will be some very familiar tune strings but without dialogue; a cost-effective and creative way to adapt various music from that generation without worrying about the rights. Often times, independent film is its own enemy due to the casting process and not being able to afford established names or talent that truly took an acting class much less several. Rest assured that is not the case here, with both the young and old actors all serving their screen time with the utmost professionalism. The goal is to like these four boys, and it takes only the first few scenes, to warrant audience care. The real gem being lead Davey Armstrong, portrayed by Canadian born Graham Verchere (“The Good Doctor”, “Woody Woodpecker”), who right away is the kid we’re meant to follow and believe in his story. Verchere plays the levels as if each scene were a number, and he is dead on that number as the movie progresses. Verchere brings an honesty and energetic innocence rarely seen with his age group. What’s his story anyway? He has to convince not just his friends, but his family that their neighbor, Mr. Mackey (Rich Sommer, “GLOW”, “Mad Men”) is actually responsible for the deaths of several local kids. Sommer’s performance counter-balances the young Verchere appropriately; laying in the do-you-trust-him-do-you-don’t right up until a climactic moment that pushes the story forward. Mackey is also Officer Mackey, which instantly gives a hurdle with which the boys have to overcome. Clever nods to trends of the 80s are planted throughout, and without being obscene, also come into play such as an old G.I. Joe walkie-talkie toy set. The kids have to be clever in their mission to uncover the truth. The film joyously delights in red-herrings and no matter how many horror movies you have seen, there will still come a time where you question whether Davey Armstrong is right or chasing a wrong lead. This is why the film works. It gives you reason to care. The story isn’t rushed and builds, little by little, establishing supporting characters and even exploring each of the other boys’ lifestyles to add that bit of gravy to this fine course meal. Judah Lewis (“The Babysitter”, “Game of Silence”), as Tommy Eaton, is almost too perfect as that darkly gothic, almost punk rock, emo character that you believe is going to be a one-directional sarcastic prick but expands to become a fully fleshed out kid that you feel sorry for and hope, whether through his doing or not, that he doesn’t fall victim to the killer. Each boy has their own personal struggle and conflict that they have to resolve. Not like in IT, with Pennywise using their fears, but common family struggles – dynamics that everybody goes through at one point or another. Sounding too soft? Think again. The gore quotient is not on display here and is never meant to be. The horror has to come from the human elements but those worried don’t need to fear, the killer uses some rather Jeffrey Dahmer disposal tactics to hide their victims as revealed in the third act. The puzzle pieces come together and once the killer is revealed, strap yourself in for the denouement of a lifetime. Not often seen in films, the story isn’t afraid to sacrifice a lead character or twist a happy ending resolve in order to benefit the scare factor. On a psychological level, the movie ends for our characters on a disturbing footnote – one that will carry on not just with them but with us as a viewer in their shoes. 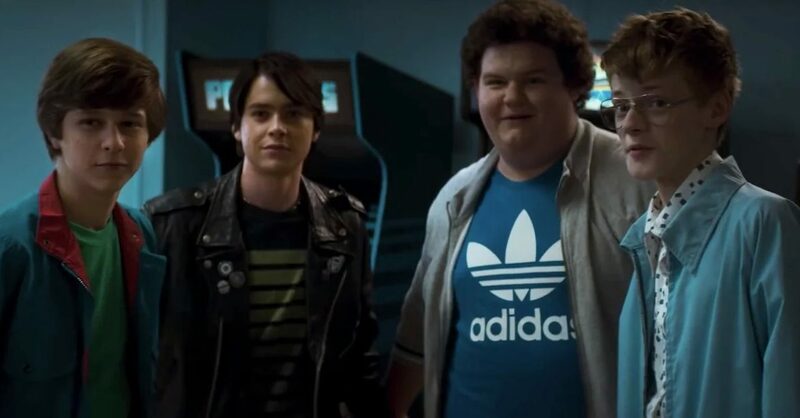 Official selections at both the Fantasia and Sundance film festivals, it is no wonder that Summer of ’84 has gathered continuously favorable reviews and feedback from genre enthusiasts. It even played recently at the Horrorhound Weekend in Indianapolis, Indiana. Now available on DVD, this movie has earned its place on a collector’s shelf. Thanks to the direction of Francois Simard, Anouk Whissell and Yoann-Karl Whissell, this film keeps the suspense building, the story flowing, the characters evolving and blood shedding right to the final, grisly end.